I discovered MapIt after trawling through multiple trials of other GIS packages that promised much, but delivered a subset of that promise, or required significant ongoing investment in a subscription despite being rigid and incapable or tied to a specific proprietary workflow. Spatial Analytics specialises in solving spatial and measurement problems. From developing sensor and information systems to predict the state of a farm or region in the future, to spatially assessing risk. For the latter work I just love MapIt, it integrates well with most of the sensors used and provides old school (in a very positive sense) files for ingestion into GIS packages without the need for a ‘subscription service.’ The integration of dropbox export with timestamps means that I really don’t have to worry about versions and where files are, they are just in my Dropbox and the latest one, has the latest date. 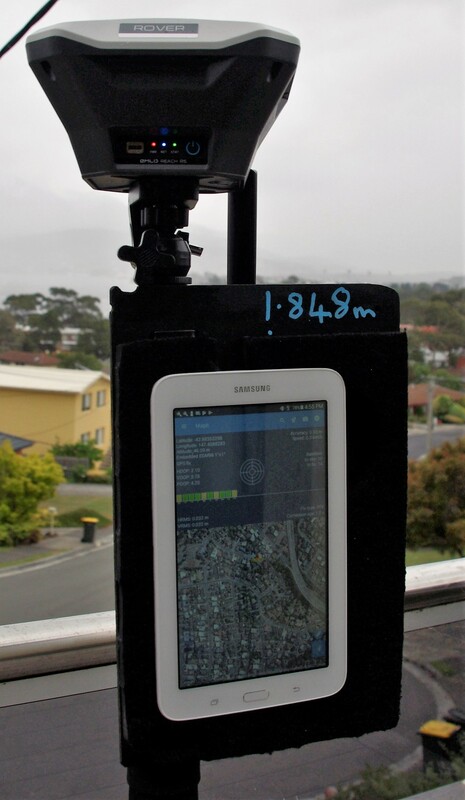 Reach RTK and MapIt App working in harmony! Reach RTK information displayed in MapIt. Mapping a field archery range. 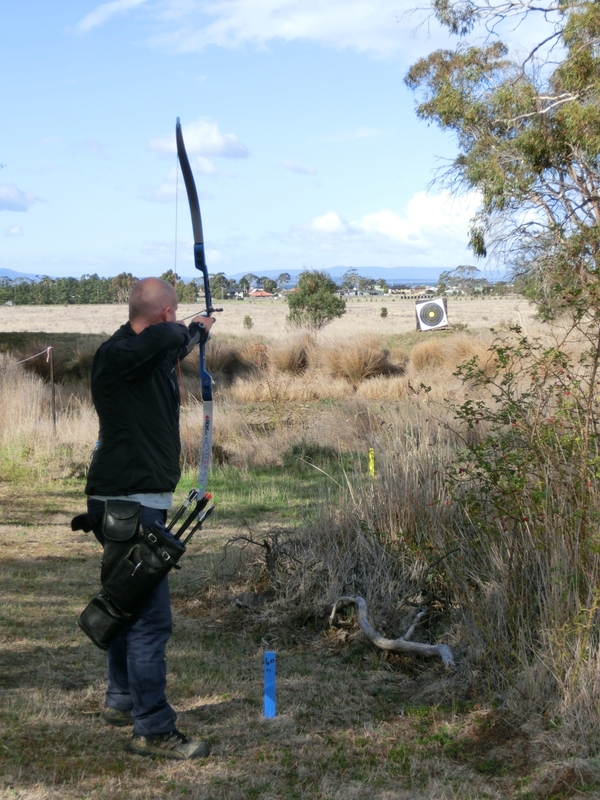 Field Archery is a great sport, wandering around the range shooting at targets set up on hills or down in gullies, sometimes at round target faces, sometimes at three dimensional life-like animal targets. The range designers deliberately make it tricky, with poor footing, awkward angles and tricky lighting, they ‘encourage’ you to miss. But what does happen if you miss? That’s where the mapping is required. A modern compound bow can fire an arrow with lethal force well over 400m (437 yards) over flat ground and further over the brow of a hill. 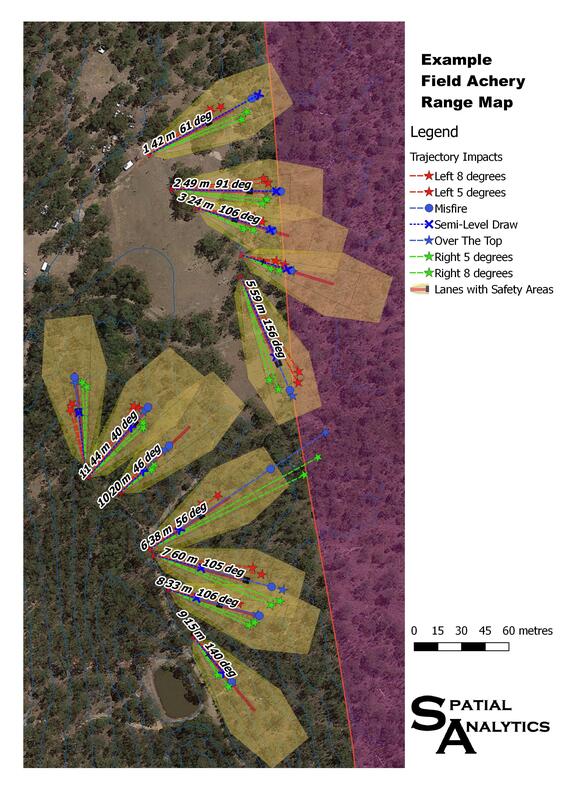 Spatial Analytics use a combination of accurate mapping with detailed digital terrain surfaces and ballistically accurate trajectory modelling to plot the potential path of a series of ‘standard shots’ that miss each target from their defined shooting positions. MapIt is an integral tool in that first phase, accurate mapping. 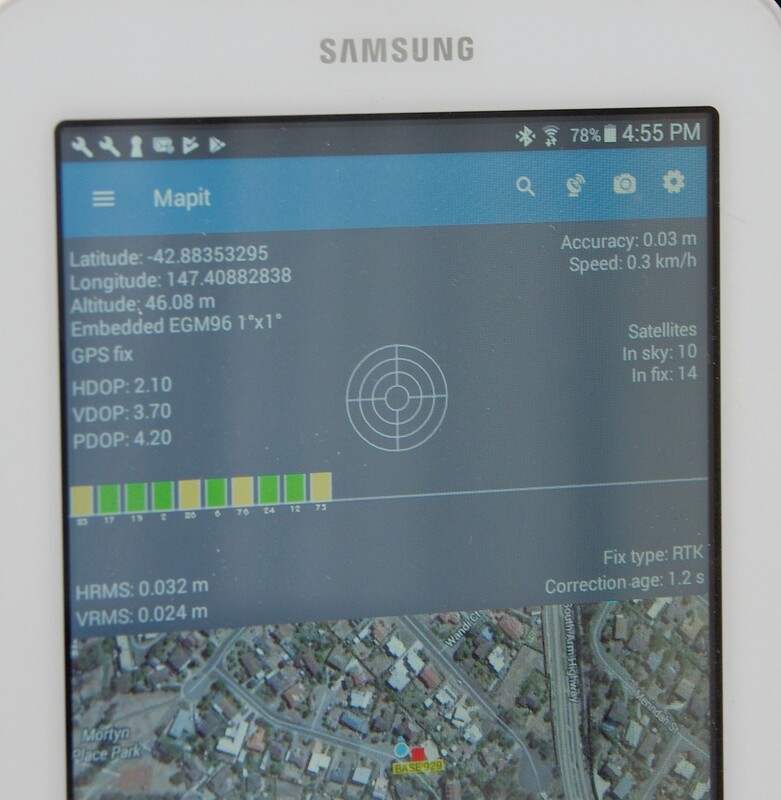 Mapit accepts the RTK position output from my Reach GNSS and converts the data from WGS84 to the projection of my choice. I find it much easier working in metres directly than remembering which digit in the decimal degrees is about a metre! I will walk the range completely using the customisable attributes to record salient information about each significant point visited and record a memory jogging picture at each spot. I let the Reach RTK record both the calculated position and the raw GPS data so if necessary I can post process my position. MapIt can import (and display) many formats of GIS data this is highly valuable as I get base data from many sources. I may load property boundaries prior to my inspection so that I may pay special attention to target lanes that could send arrows towards, or even over those boundaries. If no reliable elevation data is available, I will fly a drone mapping mission. For this to be accurate I need to collect Ground Control Points (GCP’s) Mapit’s position averaging function is great for doing that. Because some of the targets may be elevated just using the digital elevation surface to determine angles from shooting peg to target is not adequate, Mapit’s integration with my Trupulse 360B laser rangefinder is a big plus. When Mapit is updated to record the Line of site distance, angle and bearing, and reference position in the point metadata, promised sometime soon, I will be in Nirvana when it comes to seamless, auditable data collection. In the meantime I use line segments to do this and the customisable attributes to record the data that is not automatically collected. Once I have a reliable and accurate survey completed and a map produced, follow up visits are a breeze as I will upload the map to Mapbox in advance and have it show up as my raster basemap whilst on site. This could as easily be achieved using vector files, but by displaying the historical data in the raster it allows me to keep the vector layers for the current data collection program. If I have been designing a field course rather than mapping it then Mapit’s ability to display multiple vector files of multiple formats is a boon. I can load up my target lanes and peg positions as vectors and set about staking out the ground assured that the positions I place them, when combined with Reach RTK, are as accurate as can be. This is the equivalent of a construction staking out scenario. If there was one thing that would be useful at this point it would be the option to zoom in further, although Waze Navigation does a good job of giving me my distance and bearing to a pre-defined point. Arrow trajectories plotted over the terrain. What lies beyond the target? 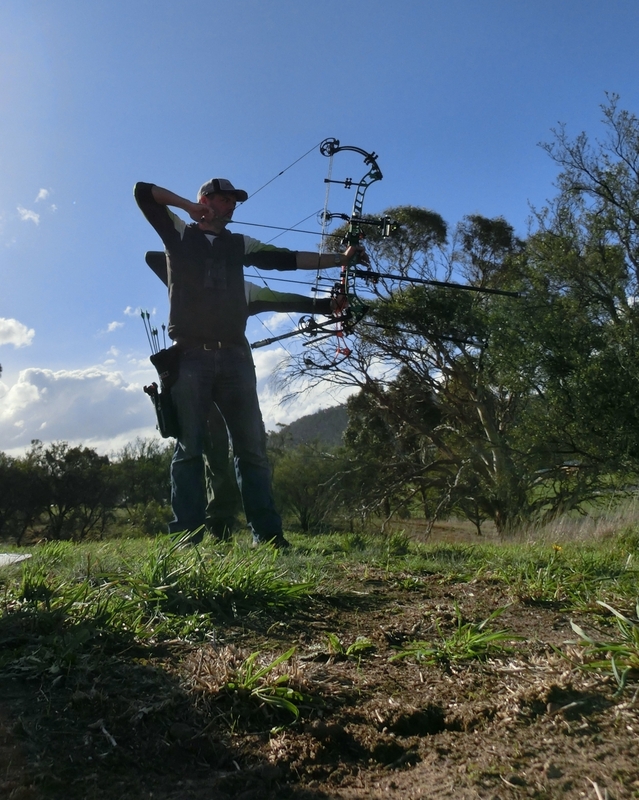 Evening archery on a safe range, verified using Reach RTK, MapIt, and Trupulse 360B laser, combined with drone based elevation data and photography.